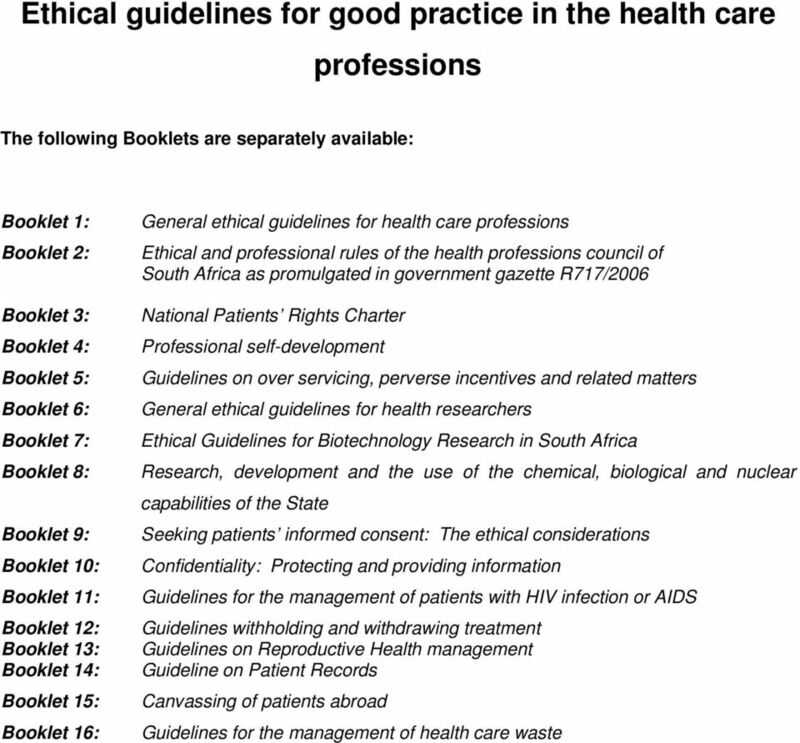 Download "THE HEALTH CARE PROFESSIONS COUNCIL OF SOUTH AFRICA GUIDELINES FOR GOOD PRACTICE IN THE HEALTH CARE PROFESSIONS"
3 i THE SPIRIT OF PROFESSIONAL GUIDELINES Practice as a health care professional is based upon a relationship of mutual trust between patients and health care practitioners. The term profession means a dedication, promise or commitment publicly made. 1 To be a good health care practitioner, requires a life-long commitment to sound professional and ethical practices and an overriding dedication to the interests of one s fellow human beings and society. In essence, practice as a health care professional is a moral enterprise. 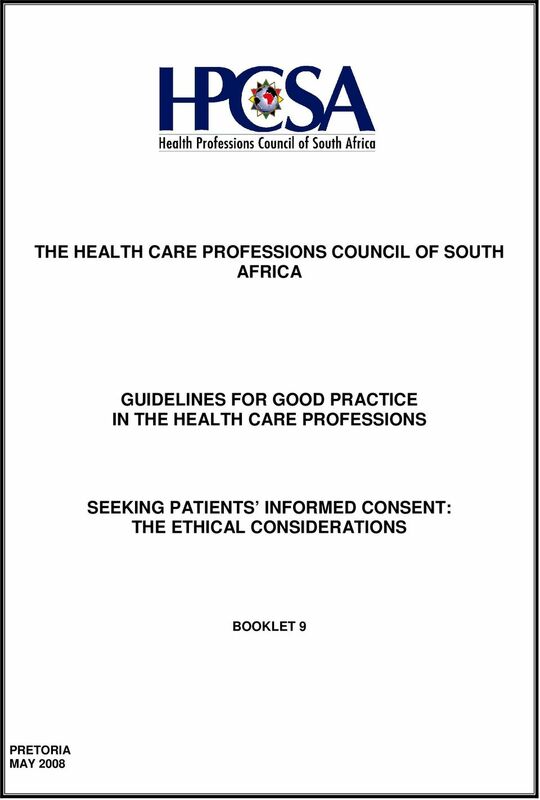 In this spirit the HPCSA presents the following ethical guidelines to guide and direct the practice of health care practitioners. These guidelines form an integral part of the standards of professional conduct against which a complaint of professional misconduct will be evaluated. 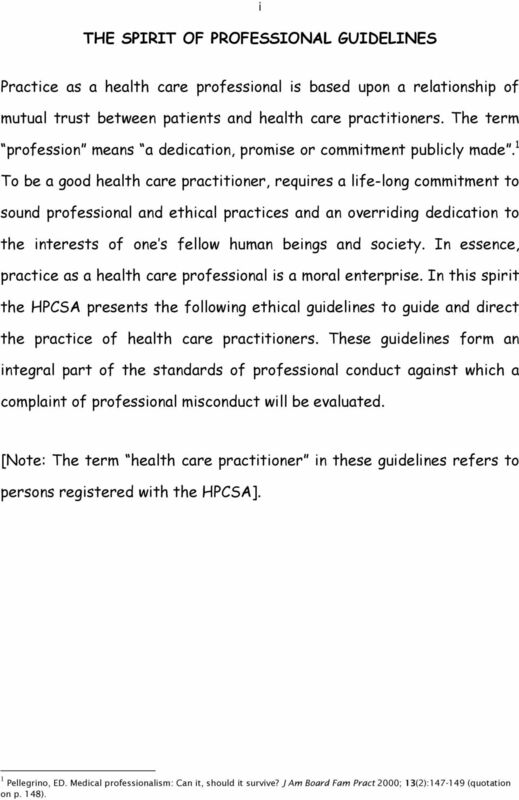 [Note: The term health care practitioner in these guidelines refers to persons registered with the HPCSA]. 1 Pellegrino, ED. Medical professionalism: Can it, should it survive? J Am Board Fam Pract 2000; 13(2): (quotation on p. 148). 6 Their patient s health status except in circumstances where there is substantial evidence that the disclosure of the patient s health status would be contrary to the best interests of the patient; The range of diagnostic procedures and treatment options generally available to the patient; The benefits, risks costs and consequences generally associated with each option; and The patient s right to refuse health services and explain the implications, risks and obligations of such refusal Patients have a right to information about any condition or disease from which they are suffering. This information should be presented in a language that the patient understands. 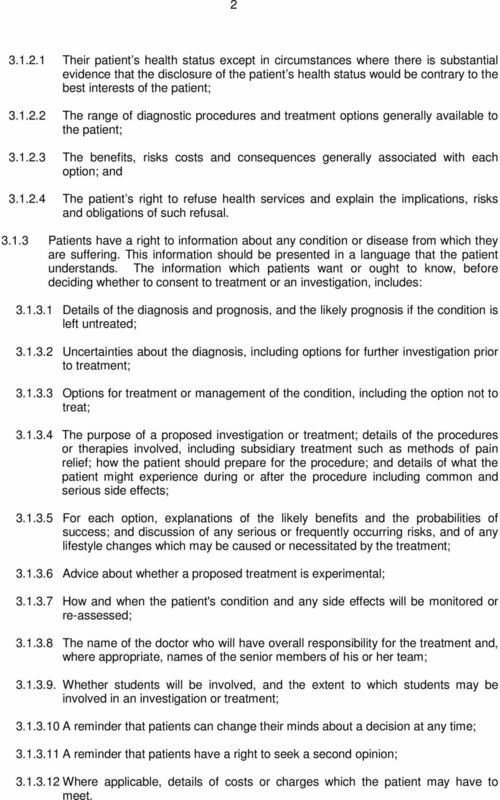 The information which patients want or ought to know, before deciding whether to consent to treatment or an investigation, includes: Details of the diagnosis and prognosis, and the likely prognosis if the condition is left untreated; Uncertainties about the diagnosis, including options for further investigation prior to treatment; Options for treatment or management of the condition, including the option not to treat; The purpose of a proposed investigation or treatment; details of the procedures or therapies involved, including subsidiary treatment such as methods of pain relief; how the patient should prepare for the procedure; and details of what the patient might experience during or after the procedure including common and serious side effects; For each option, explanations of the likely benefits and the probabilities of success; and discussion of any serious or frequently occurring risks, and of any lifestyle changes which may be caused or necessitated by the treatment; Advice about whether a proposed treatment is experimental; How and when the patient's condition and any side effects will be monitored or re-assessed; The name of the doctor who will have overall responsibility for the treatment and, where appropriate, names of the senior members of his or her team; Whether students will be involved, and the extent to which students may be involved in an investigation or treatment; A reminder that patients can change their minds about a decision at any time; A reminder that patients have a right to seek a second opinion; Where applicable, details of costs or charges which the patient may have to meet. 10 Has sufficient knowledge of the proposed investigation or treatment and understands the risks involved; and Acts in accordance with the guidance in this Booklet. 5.2 A health care practitioner will remain responsible for ensuring that, before he or she starts any treatment, the patient has been given sufficient time and information to make an informed decision, and has given consent to the investigation or procedure 6. THE RIGHT OF PATIENTS TO INFORMATION 6.1 Patients have a right to information about the health care services available to them, presented in a way that is easy to follow and use. 6.2 The National Health Act provides that health care providers (this includes health care practitioners) must inform users (patients) of the following: The user s health status except in circumstances where there is substantial evidence that the disclosure of the user s health status would be contrary to the best interests of the user; The range of diagnostic procedures and treatment options generally available to the user; The benefits, risks costs and consequences generally associated with each option; and The user s right to refuse health services and explain the implications, risks and obligations of such refusal. 7. 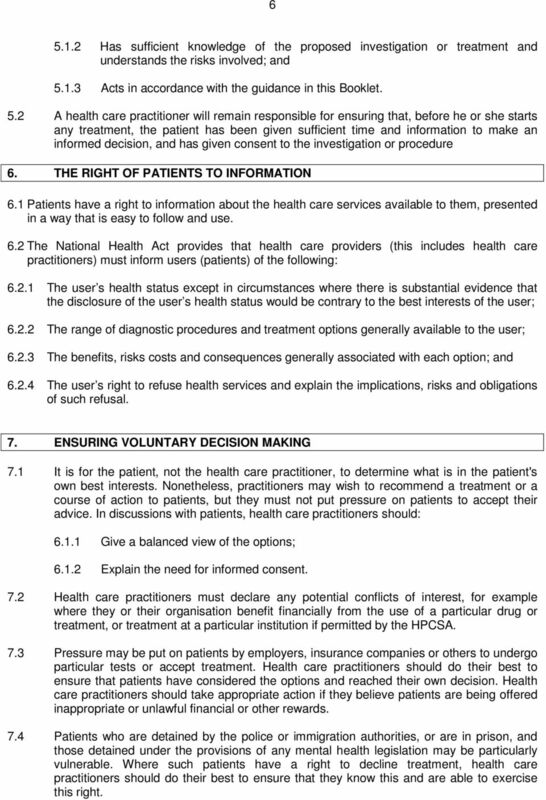 ENSURING VOLUNTARY DECISION MAKING 7.1 It is for the patient, not the health care practitioner, to determine what is in the patient's own best interests. Nonetheless, practitioners may wish to recommend a treatment or a course of action to patients, but they must not put pressure on patients to accept their advice. In discussions with patients, health care practitioners should: Give a balanced view of the options; Explain the need for informed consent. 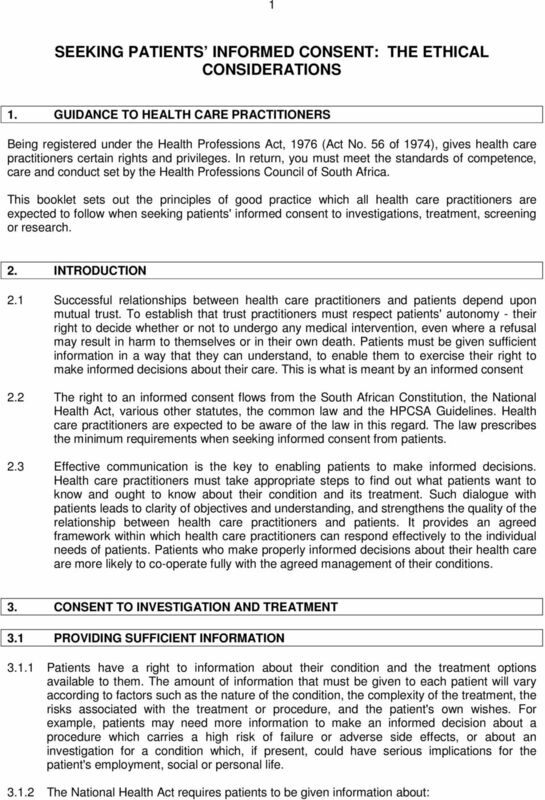 7.2 Health care practitioners must declare any potential conflicts of interest, for example where they or their organisation benefit financially from the use of a particular drug or treatment, or treatment at a particular institution if permitted by the HPCSA. 7.3 Pressure may be put on patients by employers, insurance companies or others to undergo particular tests or accept treatment. Health care practitioners should do their best to ensure that patients have considered the options and reached their own decision. Health care practitioners should take appropriate action if they believe patients are being offered inappropriate or unlawful financial or other rewards. 7.4 Patients who are detained by the police or immigration authorities, or are in prison, and those detained under the provisions of any mental health legislation may be particularly vulnerable. Where such patients have a right to decline treatment, health care practitioners should do their best to ensure that they know this and are able to exercise this right. 11 7 8 EMERGENCIES 8.1 In an emergency, where consent cannot be obtained, health care practitioners may provide medical treatment to anyone who needs it, provided the treatment is limited to what is immediately necessary to save life or avoid significant deterioration in the patient's health. 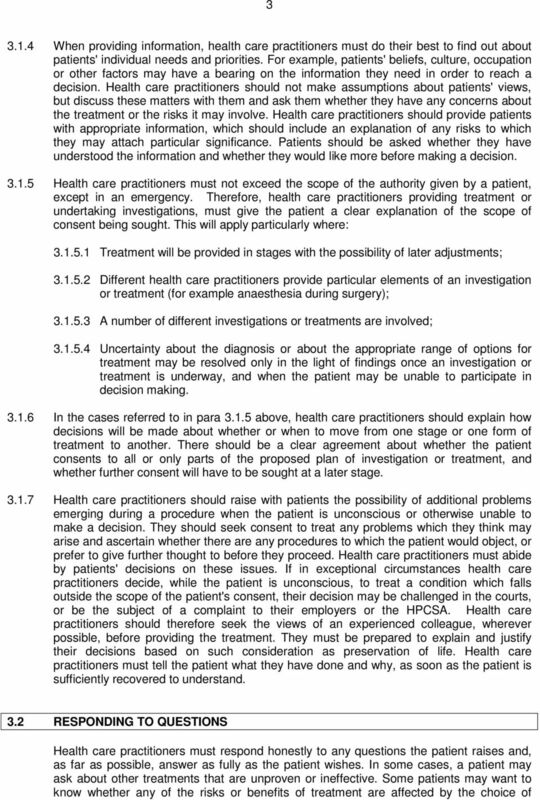 8.2 However, health care practitioners must respect the terms of any valid advance refusal by the patient which they know about, or which is drawn to their attention. 8.3 After the emergency health care practitioners should tell the patient what has been done and why, as soon as the patient is sufficiently recovered to understand. 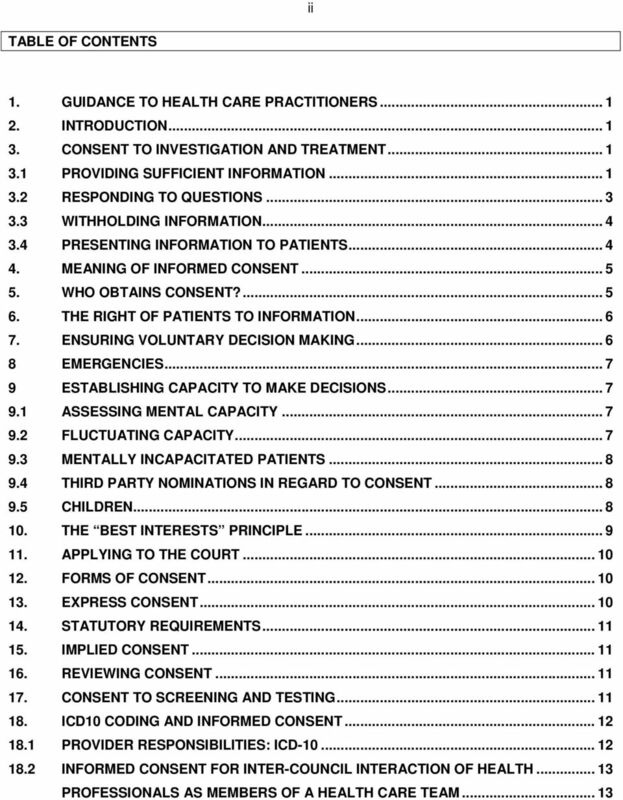 9 ESTABLISHING CAPACITY TO MAKE DECISIONS 9.1 ASSESSING MENTAL CAPACITY 9.1 Health care practitioners must work on the presumption that every adult has the capacity to decide whether to consent to, or refuse, proposed medical intervention, unless it is shown that they cannot understand information presented in a clear way. 9.2 If a patient's choice appears irrational, or does not accord with the health care practitioner s view of what is in the patient's best interests, this is not evidence in itself that the patient lacks competence. In such circumstances it may be appropriate to review with the patient whether all reasonable steps have been taken to identify and meet their information needs. 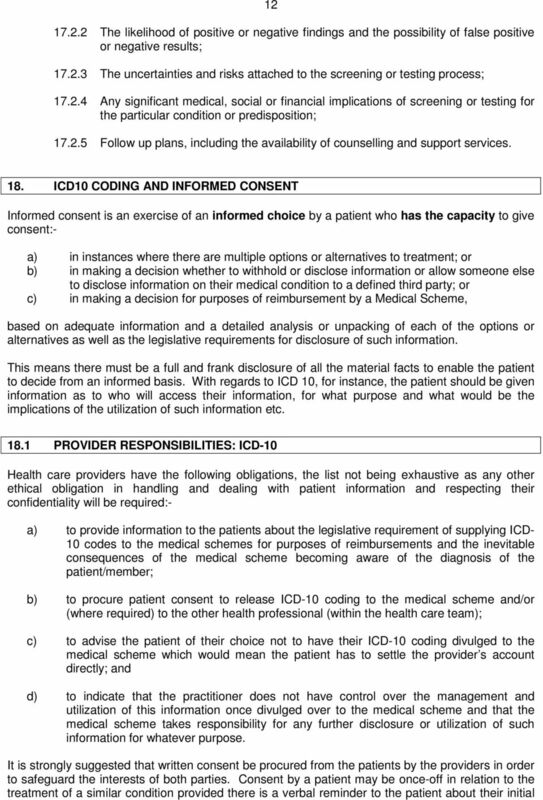 9.3 Where health care practitioners need to assess a patient's capacity to make a decision, they should consult the guidance issued by the relevant professional bodies. 9.4 In the case of children who have legal capacity to give consent in terms of the Child Care Act (Act No.74 of 1983) or the Choice on Termination of Pregnancy Act (Act No. 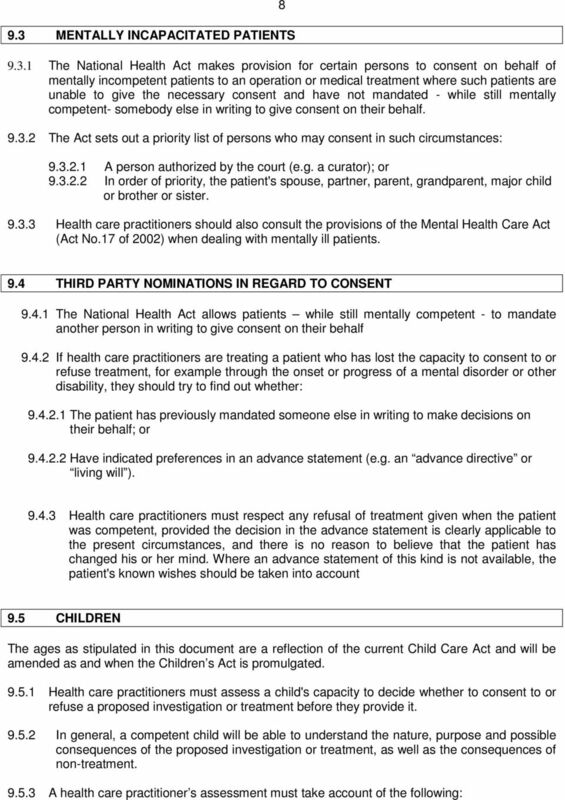 92 of 1996) health care practitioners should make sure that the children are sufficiently mentally mature to understand the nature and effect of the treatment or procedure to which they are consenting (see below para 8.5). 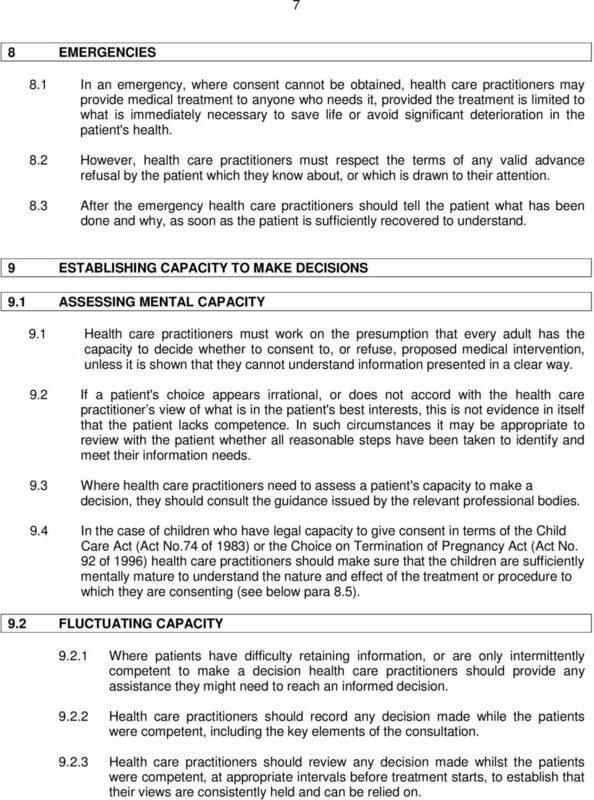 9.2 FLUCTUATING CAPACITY Where patients have difficulty retaining information, or are only intermittently competent to make a decision health care practitioners should provide any assistance they might need to reach an informed decision Health care practitioners should record any decision made while the patients were competent, including the key elements of the consultation Health care practitioners should review any decision made whilst the patients were competent, at appropriate intervals before treatment starts, to establish that their views are consistently held and can be relied on. 13 A minor over the age of 18 years can be treated as an adult and is legally competent to decide on all forms of treatment and medical procedures (Child Care Act) Children of 12 years of age are legally competent to decide on medical treatment only (Child Care Act) A child over the age of 12 years is legally competent to consent to a termination of pregnancy (Choice on Termination of Pregnancy Act) Where a legally competent child under the age of 18 years refuses life-saving treatment, application may be made to court for it to authorise treatment which is in the child's best interests. Legal advice may be helpful on how to deal with such cases Where a child is not legally competent to give or withhold informed consent, the parent or guardian may authorise investigations or treatment which are in the child's best interests. 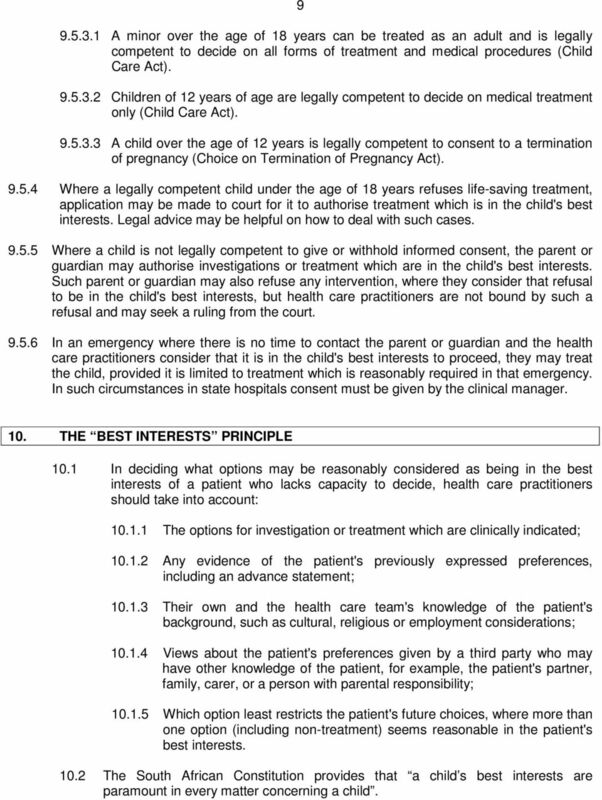 Such parent or guardian may also refuse any intervention, where they consider that refusal to be in the child's best interests, but health care practitioners are not bound by such a refusal and may seek a ruling from the court In an emergency where there is no time to contact the parent or guardian and the health care practitioners consider that it is in the child's best interests to proceed, they may treat the child, provided it is limited to treatment which is reasonably required in that emergency. In such circumstances in state hospitals consent must be given by the clinical manager. 10. THE BEST INTERESTS PRINCIPLE 10.1 In deciding what options may be reasonably considered as being in the best interests of a patient who lacks capacity to decide, health care practitioners should take into account: The options for investigation or treatment which are clinically indicated; Any evidence of the patient's previously expressed preferences, including an advance statement; Their own and the health care team's knowledge of the patient's background, such as cultural, religious or employment considerations; Views about the patient's preferences given by a third party who may have other knowledge of the patient, for example, the patient's partner, family, carer, or a person with parental responsibility; Which option least restricts the patient's future choices, where more than one option (including non-treatment) seems reasonable in the patient's best interests The South African Constitution provides that a child s best interests are paramount in every matter concerning a child. 14 APPLYING TO THE COURT 11.1 Where a patient's capacity to consent is in doubt, or where differences of opinion about his or her best interests cannot be resolved satisfactorily, health care practitioners should consult more experienced colleagues and, where appropriate, seek legal advice on whether it is necessary to apply to the court for a ruling Health care practitioners should seek the court's approval where a patient lacks capacity to consent to a medical intervention and the situation is controversial, for example, parents withholding consent to life-saving treatment for children under the age of 14 years Where health care practitioners decide to apply to a court they should, as soon as possible, inform the patient, or his or her representative of their decision and of his or her right to be represented at the hearing. 12. 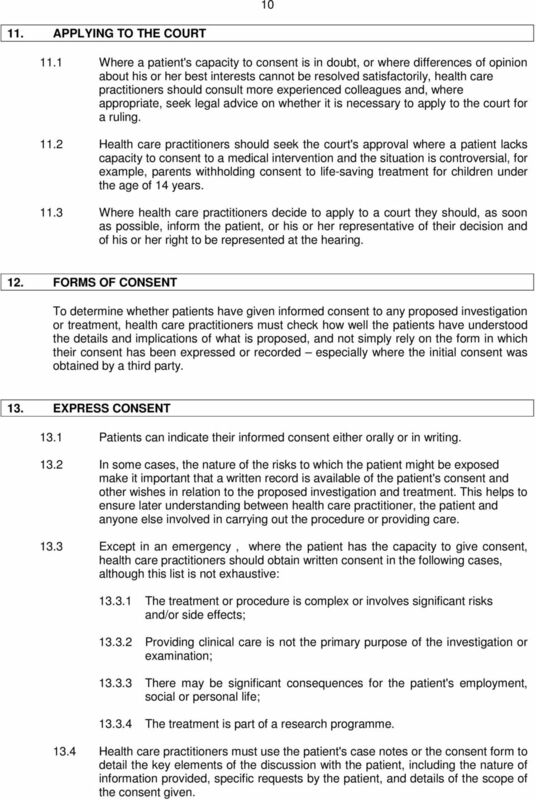 FORMS OF CONSENT To determine whether patients have given informed consent to any proposed investigation or treatment, health care practitioners must check how well the patients have understood the details and implications of what is proposed, and not simply rely on the form in which their consent has been expressed or recorded especially where the initial consent was obtained by a third party. 13. 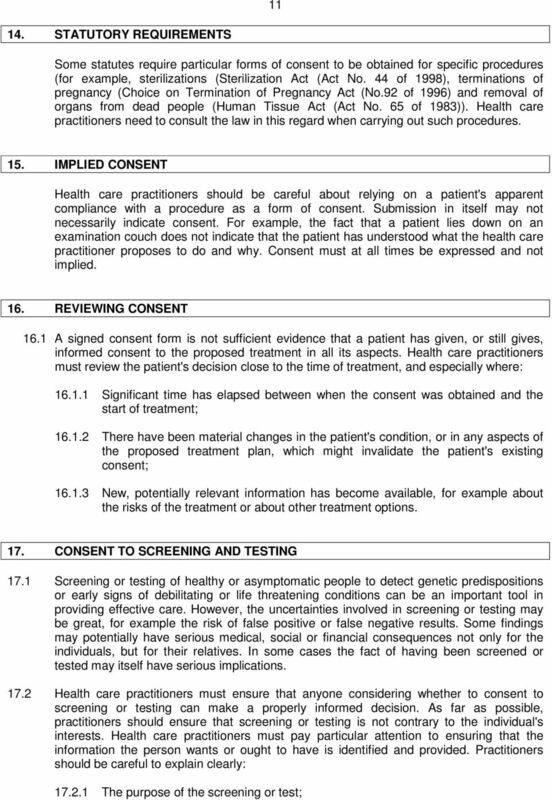 EXPRESS CONSENT 13.1 Patients can indicate their informed consent either orally or in writing In some cases, the nature of the risks to which the patient might be exposed make it important that a written record is available of the patient's consent and other wishes in relation to the proposed investigation and treatment. 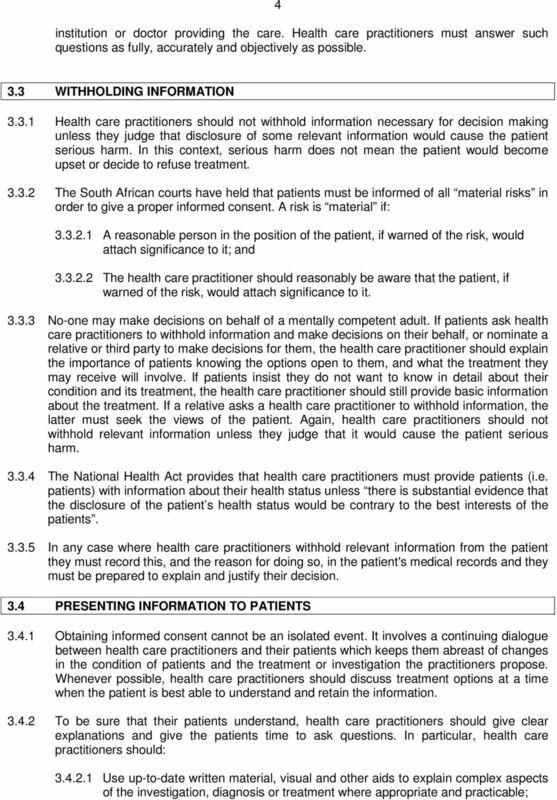 This helps to ensure later understanding between health care practitioner, the patient and anyone else involved in carrying out the procedure or providing care Except in an emergency, where the patient has the capacity to give consent, health care practitioners should obtain written consent in the following cases, although this list is not exhaustive: The treatment or procedure is complex or involves significant risks and/or side effects; Providing clinical care is not the primary purpose of the investigation or examination; There may be significant consequences for the patient's employment, social or personal life; The treatment is part of a research programme Health care practitioners must use the patient's case notes or the consent form to detail the key elements of the discussion with the patient, including the nature of information provided, specific requests by the patient, and details of the scope of the consent given. 17 13 commitment to confirm if they are still comfortable with the disclosure. It would be advisable for a provider to note the verbal reminder on that patient s file. Where a patient presents with a new or different condition, a fresh consent should be obtained from the patient and appropriately documented. Providers without a direct patient contact like pathologists and radiologists act on referrals from other providers. 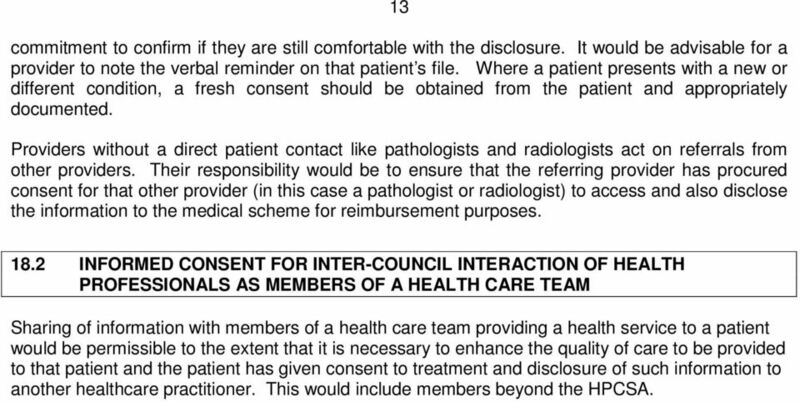 Their responsibility would be to ensure that the referring provider has procured consent for that other provider (in this case a pathologist or radiologist) to access and also disclose the information to the medical scheme for reimbursement purposes INFORMED CONSENT FOR INTER-COUNCIL INTERACTION OF HEALTH PROFESSIONALS AS MEMBERS OF A HEALTH CARE TEAM Sharing of information with members of a health care team providing a health service to a patient would be permissible to the extent that it is necessary to enhance the quality of care to be provided to that patient and the patient has given consent to treatment and disclosure of such information to another healthcare practitioner. 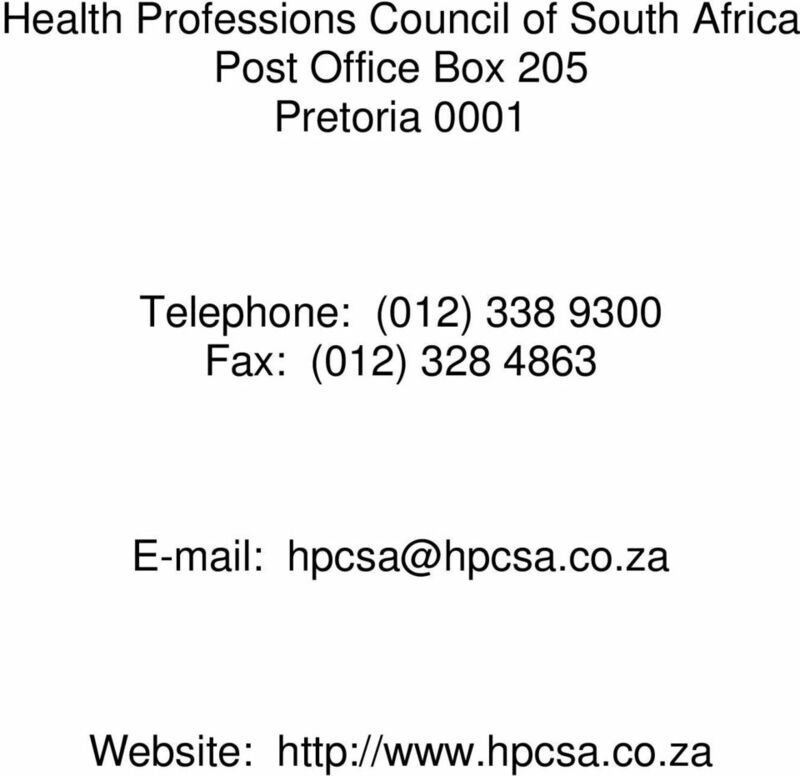 This would include members beyond the HPCSA. 16.27.18.1 ISSUING AGENCY: Regulation and Licensing Department Counseling and Therapy Practice Board [16.27.18.1 NMAC- Rp 16 NMAC 27.14. HEALTH CARE SURROGATES: What Do I Need to Know?